IRP1 (98 kda) and IRP2 (104 kda) are the iron regulatory proteins that control post-transcriptionally iron homeostasis in animal cells. 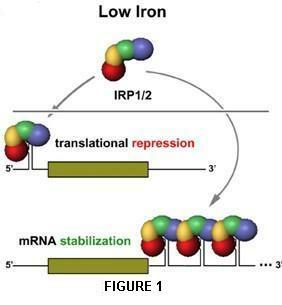 These proteins during iron scarcity or oxidative stress bind to mRNA stem-loop structures called iron responsive elements (IREs) to modulate the translation of iron metabolism genes; while in iron-rich conditions IRP1 binds an iron-sulfur cluster to function as a cytosolic aconitase and IRP2 is degraded. The regulatory outcome depends upon the position and context of the IRE in the mRNA: an IRP bound to a 5’ UTR IRE represses translation, whereas an IRP bound to an IRE in the 3’ end can indirectly activate translation through suppression of mRNA degradation (Figure 1). IRPs are members of the aconitase family with a four-domain organization. The fold of IRP1 in the c-aconitase form is closest to that of mammalian mitochondrial aconitase.The Fe-S cluster and substrate binding residues are strictly conserved, so the active sites are basically the same. c-aconitase conformation (Figure 2). The IRE-bound IRP1 molecule adopts an open “L” shaped conformation, approximately 25 Å wider than c-aconitase, making a two-point contact with the IRE: one centered on the extra-helical C of the stem, and the other on the apical loop. The IRE binding sites generally coincide with the Fe-S cluster-binding region in aconitase, utilizing many of the same amino acids. it and domain 2 to accommodate the exposed nucleotides of the apical loop. Each of the two sites contains about a dozen protein-RNA interaction. is not known to bind an Fe-S cluster and does not display aconitase activity. A partial explanation is that IRP2 has a number of amino acid substitutions in the active site could possibly interfere with the cluster assembly. IRP2 also differs from IRP1 by having a 73 amino acid insertion of unusual composition (high cysteine, glycine, lysine, and proline content) in domain 1. The IRP1 structure suggests that this insertion is on the exterior but in the same general region as the ligand-binding residues. 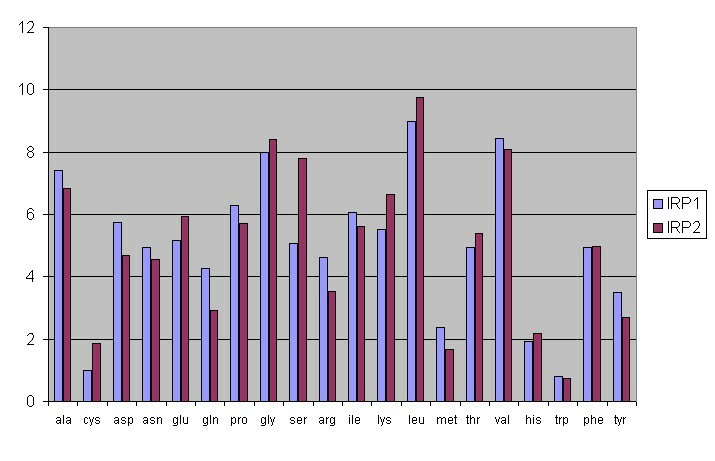 IRP1 and IRP2 are expressed by genes respectively on chromosome 9 and 15. IRPs are similar proteins in that they are ubiquitously expressed, they have citoplasmic localization and they are negatively regulated by iron: in iron-rich conditions IRP1 become c-aconitase and IRP2 is degraded. IRP1, the well-characterized IRP in cells, is a dual-function protein exhibiting either aconitase activity when cellular iron is abundant or RNA-binding activity when cellular iron is scarce. In contrast, IRP2 lacks detectable aconitase activity and functions exclusively as an RNA-binding protein. In c-aconitase form IRP1 metabolizes citrate to isocitrate so cytosolic NADP+-dependent isocitrate dehydrogenase can generate a-ketoglutarate. This process reduces NADP+ to NADPH, which is an essential cofactor for many enzymatic reactions involved in glutathione metabolism and lipid and cholesterol biosynthesis. When cellular iron is scarse IRP1 and IRP2 function as RNA-binding proteins and bind to stem-loop structures termed iron-responsive elements (IREs) that are located in the 5’ or 3’ untranslated regions (UTRs) of specific mRNAs that encode proteins involved in iron metabolism. Particulary the binding of IRPs to the 5’IREs in ferritin mRNA represses translation while the binding to five IREs located in the 3’ UTR of the transferrin receptor mRNA stabilizes the mRNA. In conditions of high iron concentrations IRP1 inventory largely changes and binds a 4Fe-4S cluster to become a functioning cytosolic (c-) aconitase enzyme. The factors that instead facilitate Fe-S cluster disassembly are: low iron/heme availability, phosphorylation of the protein, and reactive oxygen and nitrogen species. The primary means of IRP1 ‘switching’ is the iron-dependent pathway, phosphorylation of the protein can be considered an indirect manner of cluster destabilization, while the small molecule oxides and other reactive species that appear during oxidative stress are thought to act through direct attack on the cluster. The different types of cluster perturbations can happen concurrently, and beyond just the release of high IRE-affinity form can ultimately lead to IRP1 degradation. IRP2 is stabilized in response to hypoxia, while the availability of ferrous iron, oxygen and ascorbate (presumably to maintain iron in a reduced state) is critical for catalysis through ubiquitination and degradation by the proteasome. It has been proposed that the insertion of 73 amino acids functions as an "iron-dependent degradation domain" where the iron-sensing capacity of the sequence is based on site-specific oxidation of conserved cysteine residues. Developing embryos of mice that lack both copies of IRP1 and IRP2 die at the blastocyst stage, before implantation. This embryonic lethality of the IRP1−/− IRP2−/− genotype underscores the fact that the IRP-IRE regulatory system is critical for regulation of iron metabolism and that IRP1 and IRP2 have redundant functions. 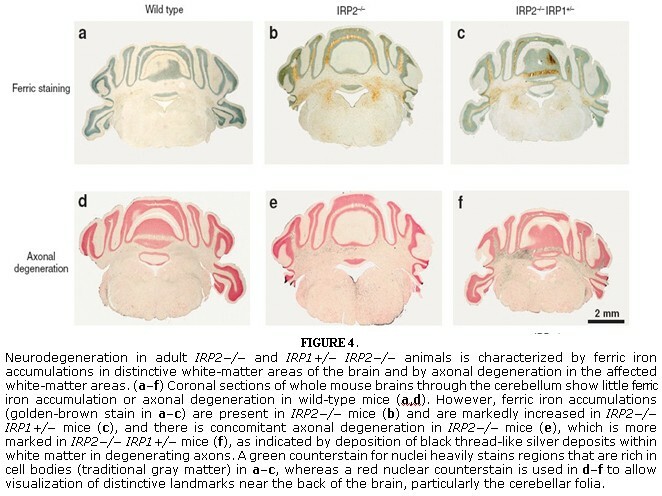 Their redundancy is further underscored by the fact that the neurodegeneration and anemia of IRP2−/− mice is greatly exacerbated in animals that also lack at least one copy of IRP1. The gene dosage effect of IRP loss is illustrated by ferric iron accumulations, which are detectable in many axon-rich regions of the brain in 1-year-old IRP2−/− mice and are pronounced in age-matched IRP1+/− IRP2−/− mice but are not detectable in age-matched wild-type mice (Figure 4). In cells, the combination of ferritin over-expression with decreased TfR1 expression may result in a state of functional iron deficiency that adversely affects axons with degeneration, which depend on iron-replete mitochondria to generate the ATP that supports axonal transport and function. Notably, animals having some residual IRP activity (IRP1+/− IRP2−/− animals) can survive to adulthood with apparent functional compromise of only the hematopoietic and neurologic systems, whereas other cells and tissues are spared. The cause of neuronal dysfunction and death is not yet clear, but it is possible that iron deficiency may adversely affect neurons by compromising synthesis of the iron-sulfur complexes of the mitochondrial respiratory chain. Figure 2. Regulation of TfR and ferritin expression in response to iron levels. The signals other than iron levels, such as nitric oxide and oxidative stress, can also regulate IRPs and modulate cellular iron metabolism. Nitric oxide and H2O2 produced from oxidative stress activate IRP-1 by a cycloheximide-insensitive post translational mechanism, whereas IRP-2 activation by nitric oxide requires de novo protein synthesis. The activation of IRP-1 by nitric oxide closely resembles the pattern of activation observed in iron-deficient cells. The activation of IRP-1 by H2O2 is different and may involve additional cellular activities probably by accelerated cluster removal rather than simply attack on IRP-1. The expression of TfRs is also regulated through the status of cellular proliferation. Generally, cells undergoing multiplication markedly increase their receptor numbers, while non-replicating cells have a stable iron balance. Cell proliferation-associated induction of TfR express could be mediated by mitogens, which modulate various protein kinase activities, through either the activation of gene transcription or the stabilization of mRNA. TfRs are also expressed on several types of non dividing cells such as reticulocytes, trophoblasts, hepatocytes, and tissue macrophages, suggesting that the relationship between TfR expression and cell activation is not a generalized phenomenon.